Have you tried extending the wear life of your shorts into the colder months? It really works—coming from someone who is constantly cold. Keep your warmth by throwing on a scarf, boots and beanie. The longer coat will keep you warm and give your outfit a good sense of balance. When dressing for winter I always try to dress my warmest first (which usually looks ridic) then subtract/trade out an item so I don’t look like the bundled up abdominal snow man. I’m obsessed with this fur snood, this will not be the last you see of it! Alsooo these tights, give a great long dimensional element to those with shorter legs. 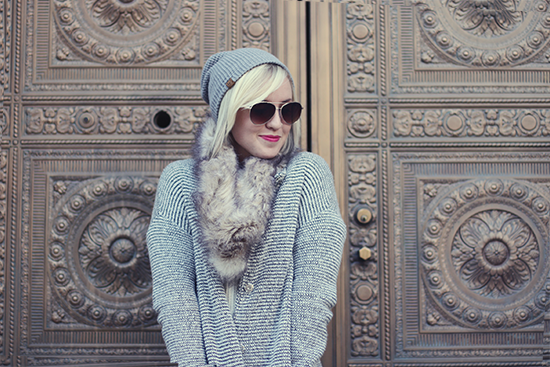 Loving this fur snood with the big sweater! So chic and cozy for the Winter!